Technically speaking, most members of this large family of flies can be identified as hoverflies by the presence of a spurious extra ‘vein’ on their wing. A few weeks ago I was out chasing newly-arrived migrant birds when a low, steady buzz approached my left ear. 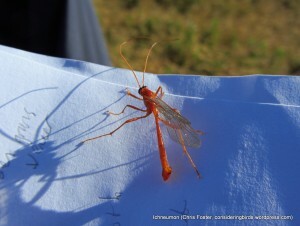 I turned to see that a large, barrel-bodied fly was keeping pace with me as I ambled, making minute adjustments to the angle of its wings every second in order to stay in perfectly level flight. 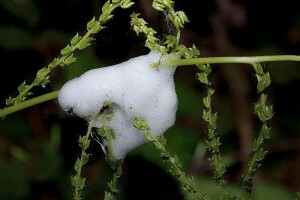 When I stopped, it too paused and simply hung in the air beside me. It was of course a hoverfly, the first I’d seen closely all year. Technically speaking, most members of this large family of flies can be identified as hoverflies by the presence of a spurious extra ‘vein’ on their wing. But short of catching and then inspecting them under a lens, you’re more likely to recognise a hoverfly the same way I did above: the clue is in the name. I was almost certainly being escorted by the Common Drone Fly, Eristalis tenax. 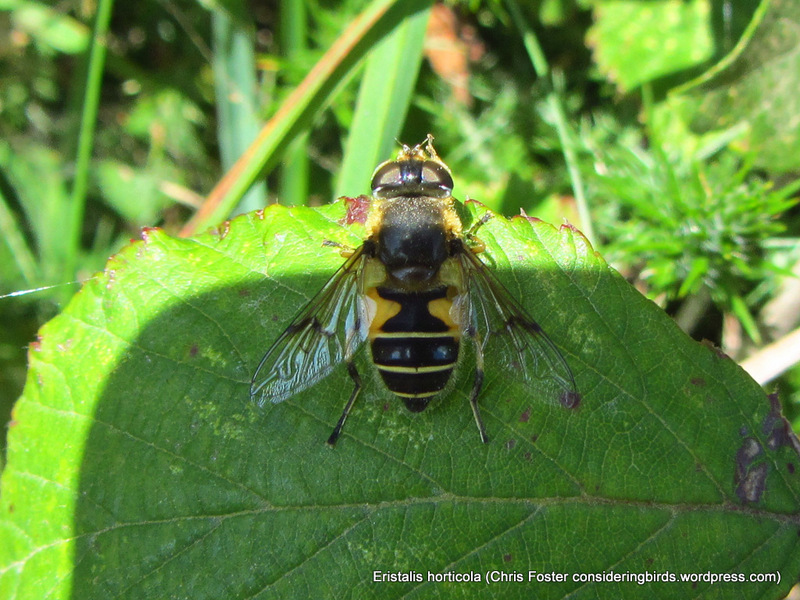 This is one of the most common hoverflies, not just in Britain but worldwide, active all year round on sunny days. Also out in good numbers at the moment is the subtly pointier Tapered Drone Fly, Eristalis pertinax. Brighter members of their tribe include Eristalis horticola (pictured) all the way to the beautifully patterned Helophilus pendulus (also pictured), which is sometimes known as ‘The Footballer’ because of its vertical stripes. If I told you what these have in common – larvae called ‘rat-tailed maggots’ – hoverflies might begin to seem less appealing, but then the multiplicity of forms taken by hoverfly larvae is actually fascinating (from aphid munchers to scavengers to slug-like inhabitants of ant nests) and, if I’m honest, still too far outside my knowledge to cover in any detail. Alongside drone flies the best known hoverflies are the Syrphini, amongst which you’ll find most of the black-and-yellow striped species – in other words, the generic hoverflies of popular imagination. I can almost guarantee that one of these, the Marmalade Hoverfly (Episyrphus balteatus), will appear in your garden at some point this year and will probably be ubiquitous by late summer once their numbers are bolstered by migrants from the continent. 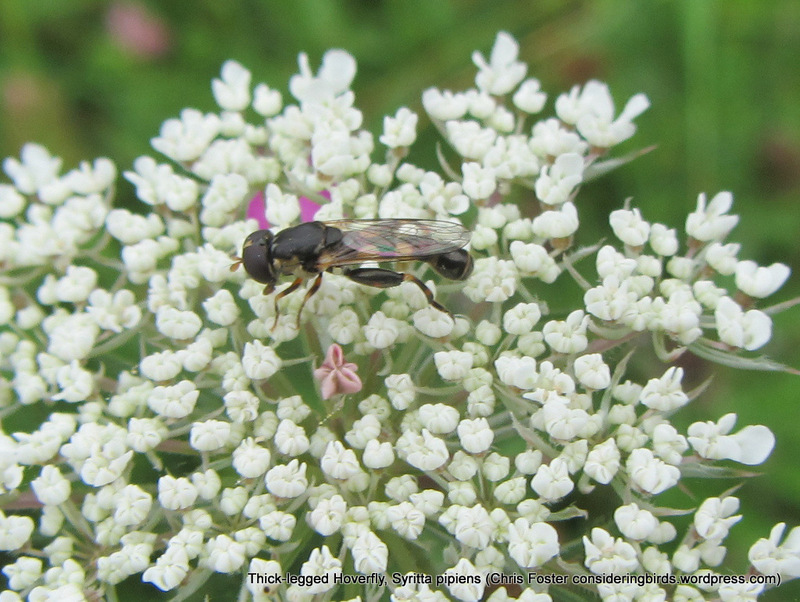 Migration being another marvel of hoverfly flight, when you think about it, beyond even their helicopter-like manoeuvrability – imagine something that small crossing the English Channel. Finally, a mention for my personal favourites: the big, bold Volucella family. 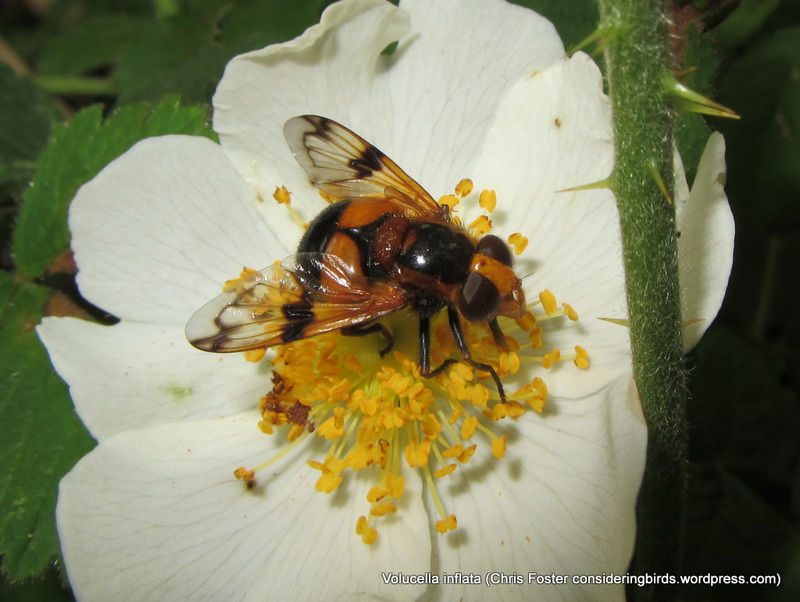 With the exception of Cossus Hoverfly (Volucella inflata, pictured) they lay their eggs in the nests of social wasps or bumblebees, and also spectacularly mimic their appearance. One to look out for is Volucella bombylans. It has two colour forms, each of which mimics a different bee species: var. bombylans taking the form of the red-tailed bumblebee, Bombus lapidarius, and var. plumata assuming a dress code similar to that of white-tailed and buff-tailed bumblebees (B. lucorum and B. terrestris). 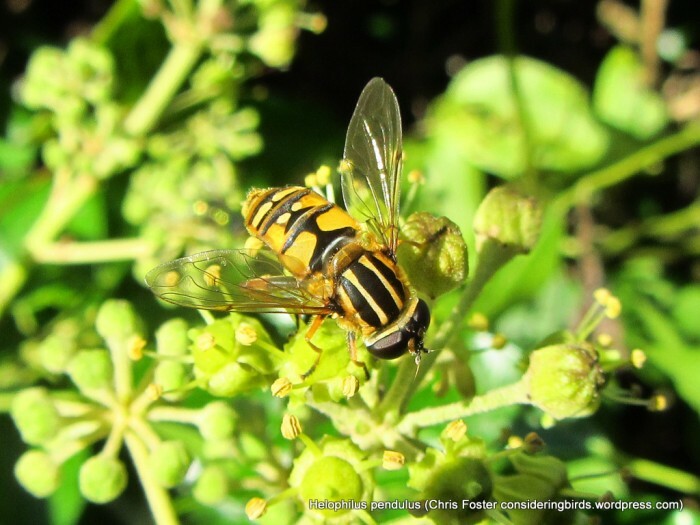 Top of my wish list for 2013 is the stunning Hornet Hoverfly (Volucella zonaria), on the increase in Britain since its first establishment in the 1940s. But with so many other splendid hoverflies among the 270 or so British species not mentioned here, I’m sure whichever I – or you – happen to find next is bound to be worth a second look. 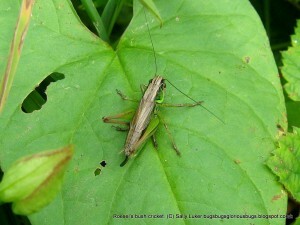 Lurking under almost every mass of cuckoo spit in Britain will be a nymph of the common froghopper, Philaenus spumarius, on its way to becoming one of the highly variable adult colour morph – which range from mottled pale brown to almost solid black. 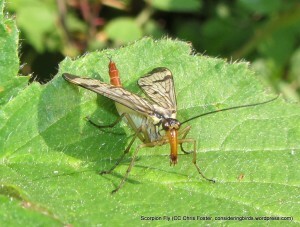 Nineteen species have been recorded in Britain, of which at least ten are resident natives, and this list is lengthening as climate change drives the distribution of many species northwards.